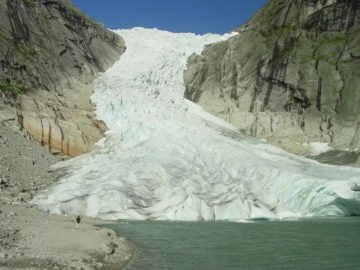 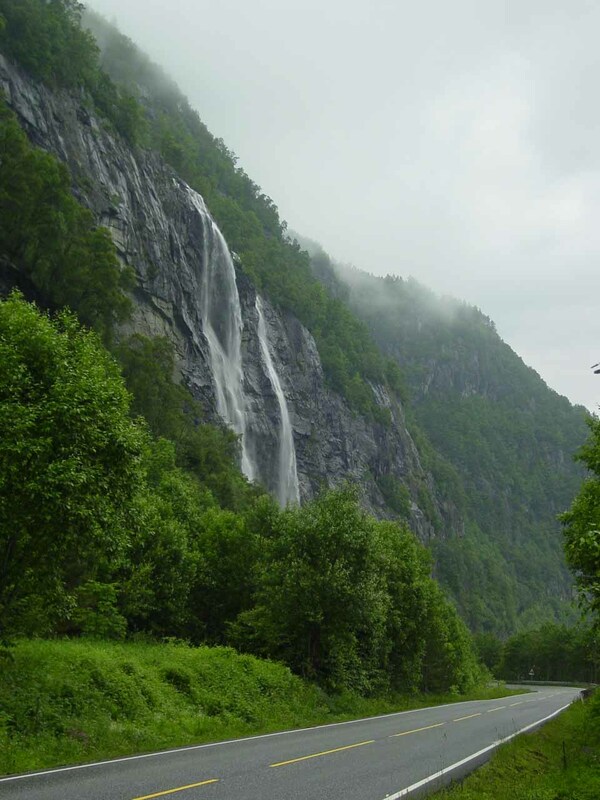 Hongavikfossen was a roadside waterfall spilling from high up the western cliffs flanking the Saudafjord before tumbling besides a tunnel (Hongavikfosstunnelen) then ultimately feeding the fjord itself. 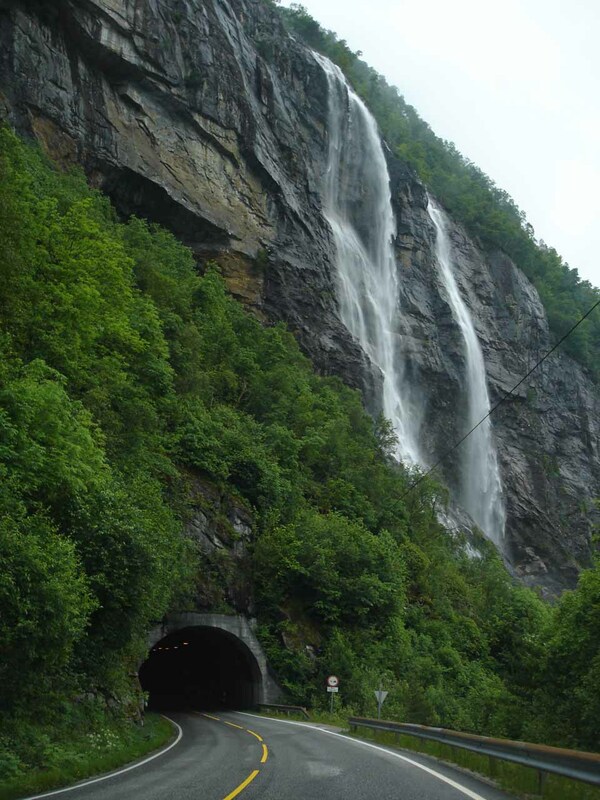 The waterfall caught our attention as we were approaching that tunnel headed north on the drive from Sand to Sauda. 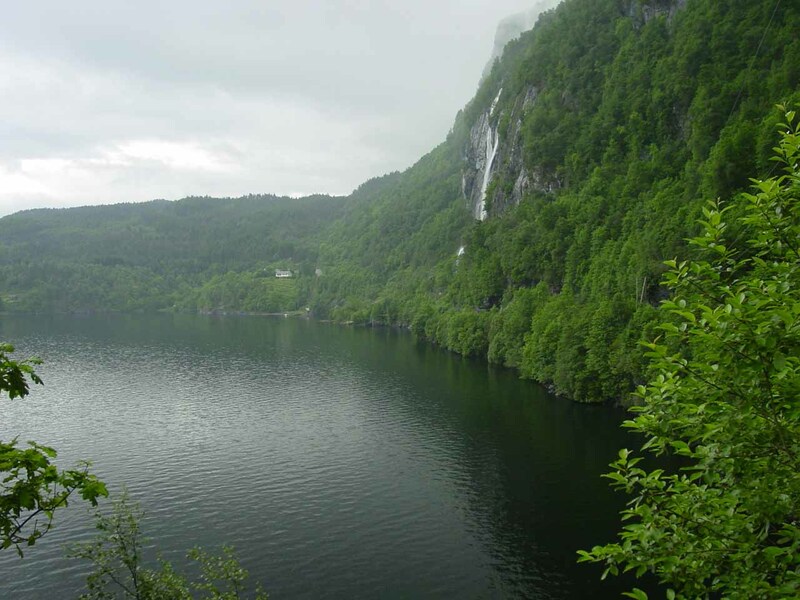 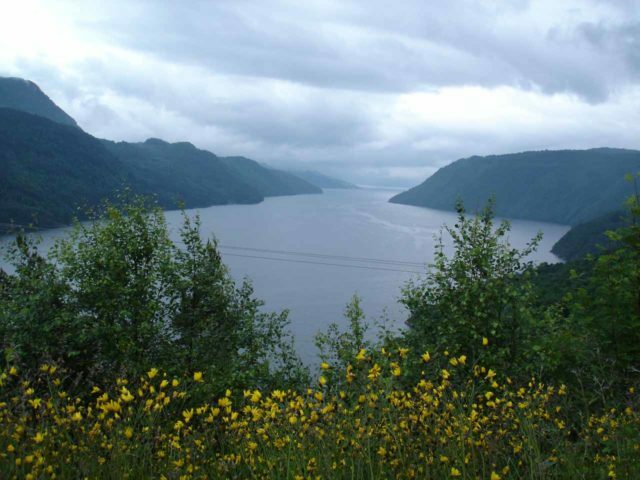 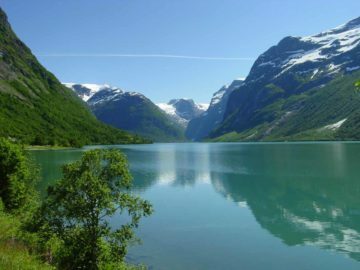 According to our road atlas, it appeared to be fed by the lake Storavatnet further up the western cliffs of Saudafjorden despite its seemingly light-flowing characteristic. 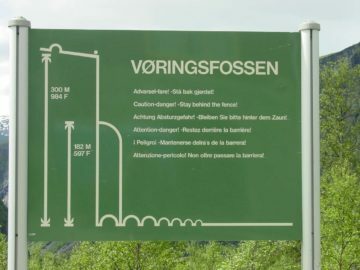 According to Norgesglasset (an online map courtesy of Statens Kartverk), this waterfall seemed to have a bunch of names. 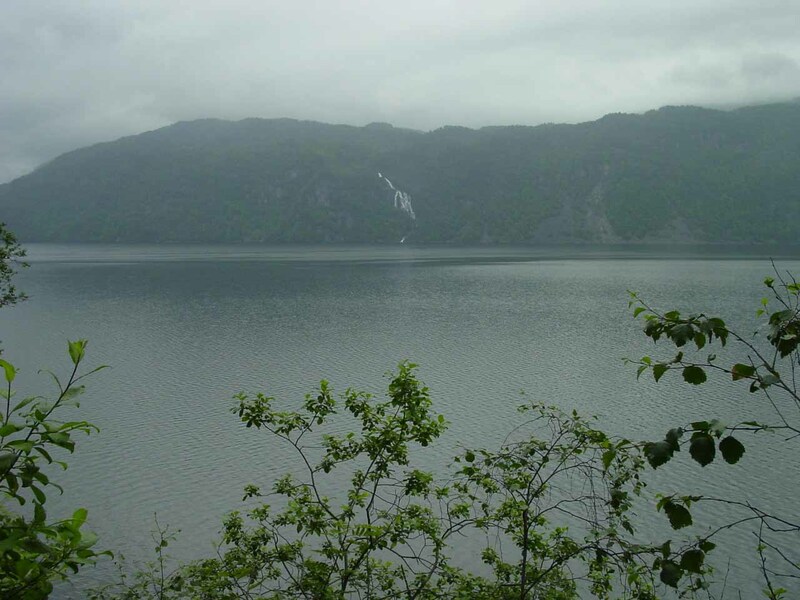 Of these names, I was only aware of the following: Hanganvikfossen (after the nearby community of Hanganvik) and Brudesløret (which I think means “the Bridal Veil”). 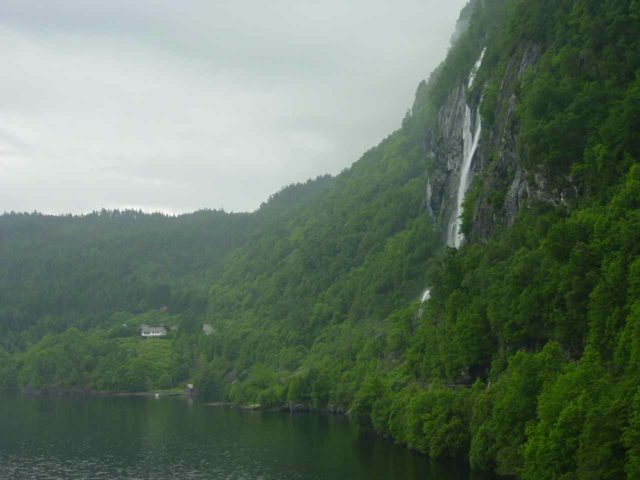 Although the falls was easily seen from within the car as we were driving north towards it, Julie and I found a little pullout and “trail” leading to the alternate view of the falls you see at the top of this page. 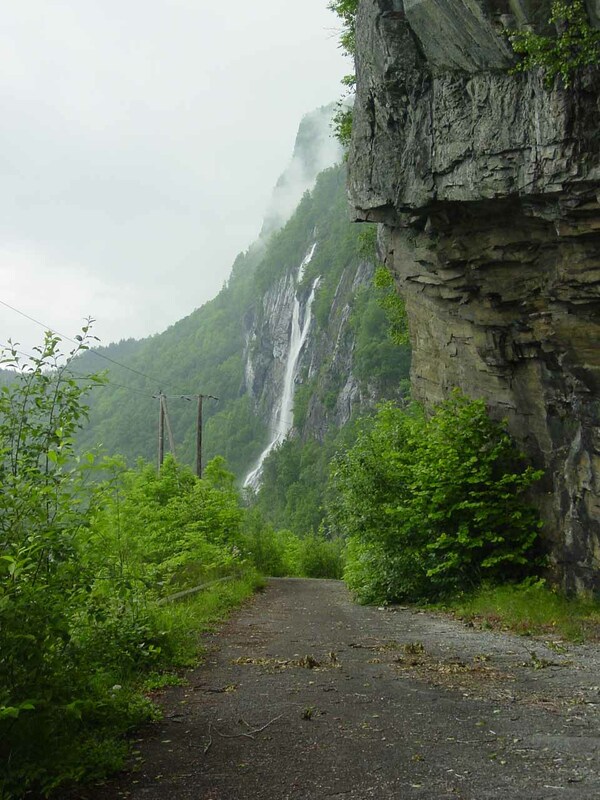 That “trail”, by the way, appeared to be where the old Rv520 went before the tunnel was completed. 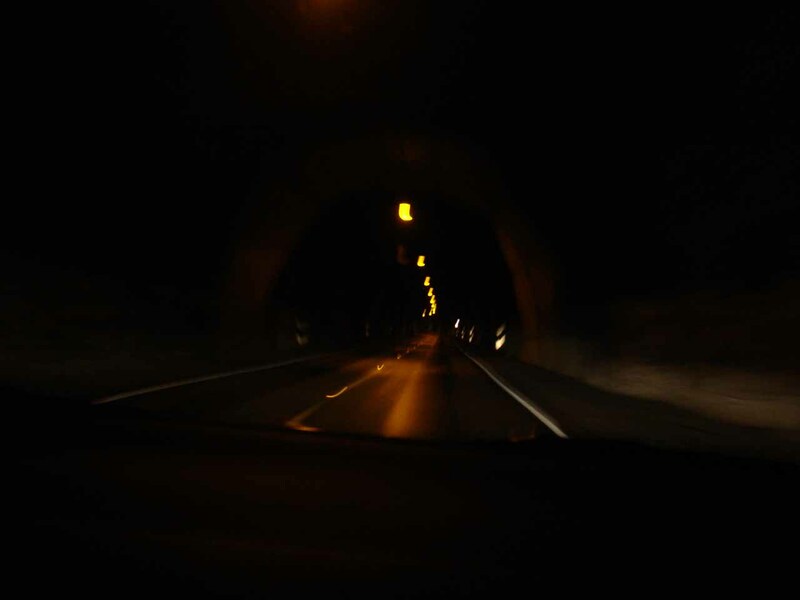 It was merely a five-minute walk or so on the paved surface (which was started to become overgrown) beneath what appeared to be power lines. 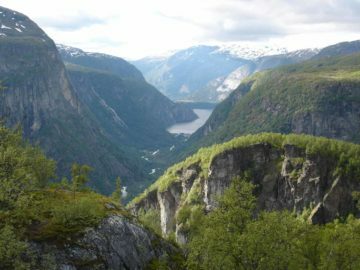 This alternate view featured the lowermost tiers of the falls framed by an attractively peaceful section of the Saudafjord. The overall height of the falls was said to be 155m. 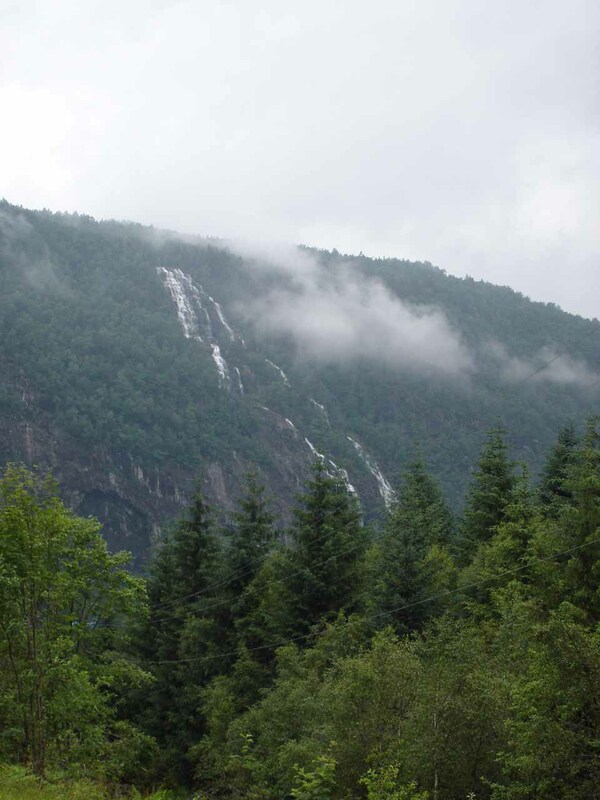 During the short walk to the alternate view of Hongavikfossen, Julie and I also noticed another giant waterfall, which I think might be called Maldalsfossen. 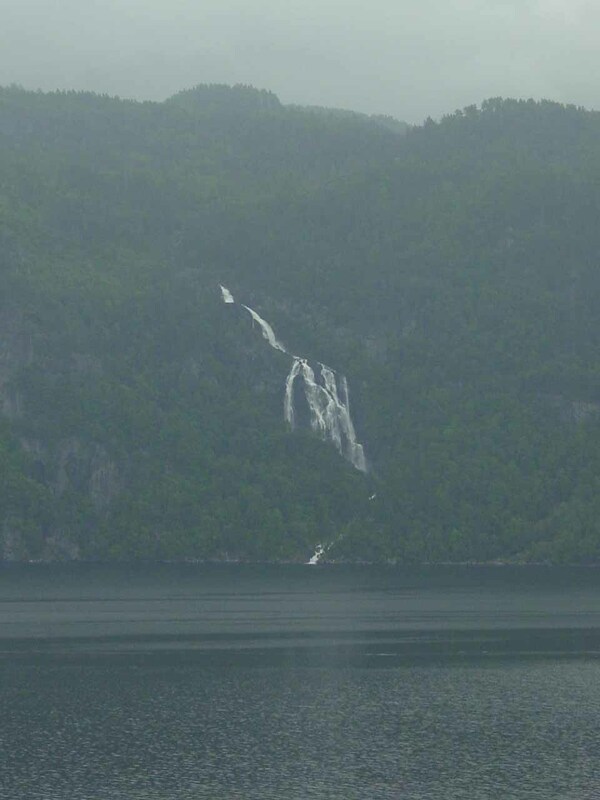 That waterfall was far away across Saudafjorden, and perhaps a closer more satisfying view could be attained on the eastern side of the fjord near the community of Maldal. 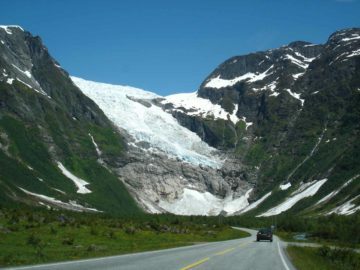 Hongavikfossen resides in the Suldal Municipality. 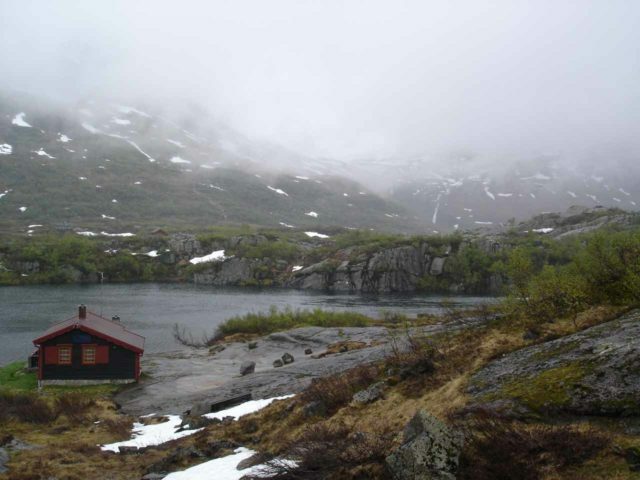 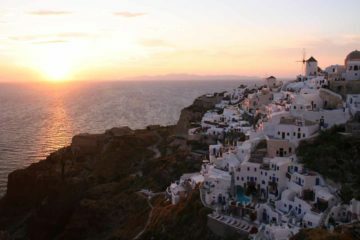 For information or inquiries about the area as well as current conditions, visit their website or their Facebook page. The falls is about 12km north of Ropeid (the western end of the ferry ride across the Sandsfjord [just south of Saudafjorden] from Sand) as we headed north on the Rv520 to Sauda from Sand. 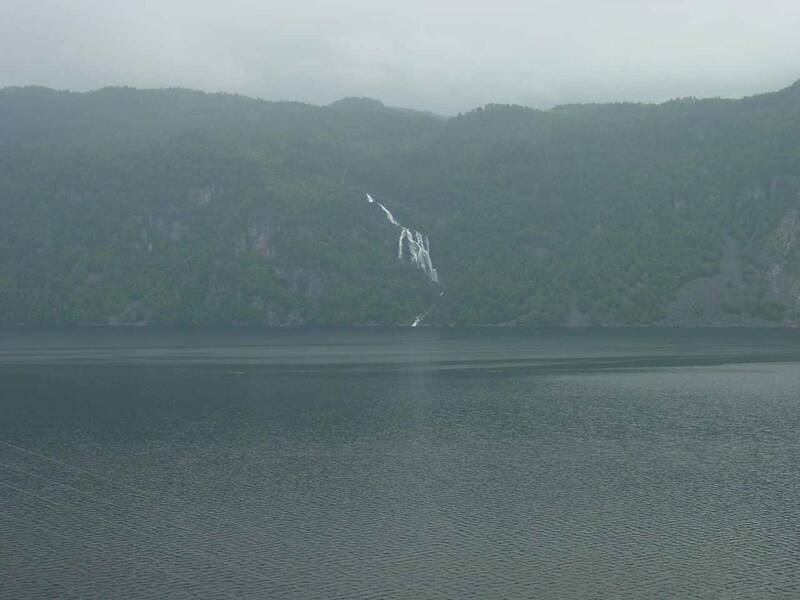 Note that the car ferry seemed to move across the fjord frequently so we didn’t have to do much planning and pre-coordination to get across (other than to wait for the ferry to show up and move us away). 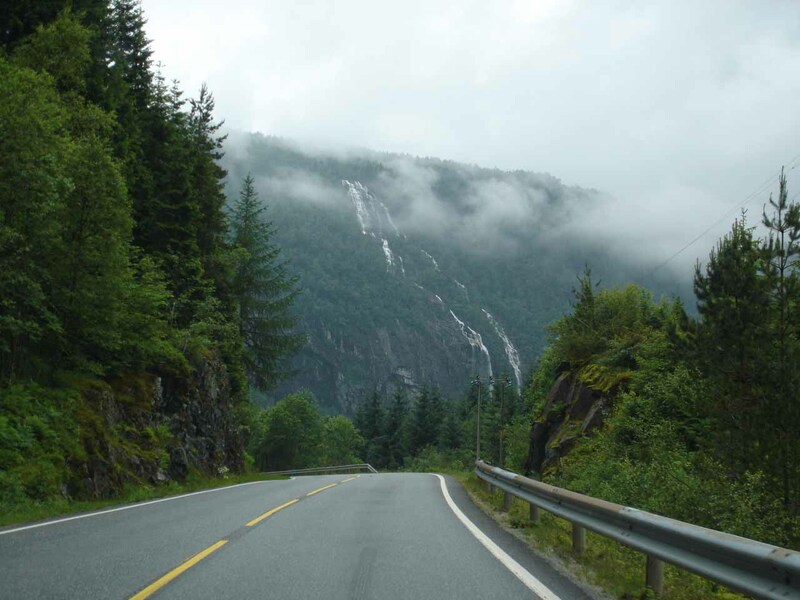 Sand was roughly 3 hours drive northeast of Stavanger with a couple of other frequent ferry crossings along the way. Contextual view of Hongavikfossen showing just how big this waterfall really is!